SER type | Products Lineup | Products | NIPPON BEARING CO., LTD.
A challenge, coupled with progress. 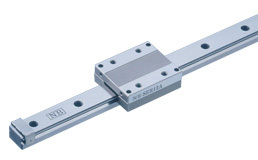 The NB SLIDE GUIDE SER type is a linear motion bearing utilizing the rotational motion of precision rollers placed in two rows. Despite its compactness, it can be used in various applications requiring high load capacity. The SER type SLIDE GUIDE consists of a rail with two precision-machined raceway grooves and a block assembly. The block assembly consists of the main body, rollers, and bottom retainers. All of these components are made of metallic materials. Since roller elements are used, the contact surface is large which provides a high load capacity and a long travel life. The wide block design (WA type) has an extremely high moment loading capacity. This will allow for single guide designs in the most demanding and compact applications. Since a cross roller method is utilized, only two raceway grooves are necessary and presents a very compact package. For the SER rails, counterbore (standard) and optional tapped hole (N) types are available enabling various installation methods. The SERS type slide guide is made of all stainless steel components, making it ideal for high temperature, clean room or vacuum applications. The SER type SLIDE GUIDE is available with a standard block or a wide block (WA) configuration. Each type can be selected with standard rails of counterbore holes or the optional N-Type rails of tapped holes. For anti-corrosion, all stainless steel type is also available with all stainless steel components.